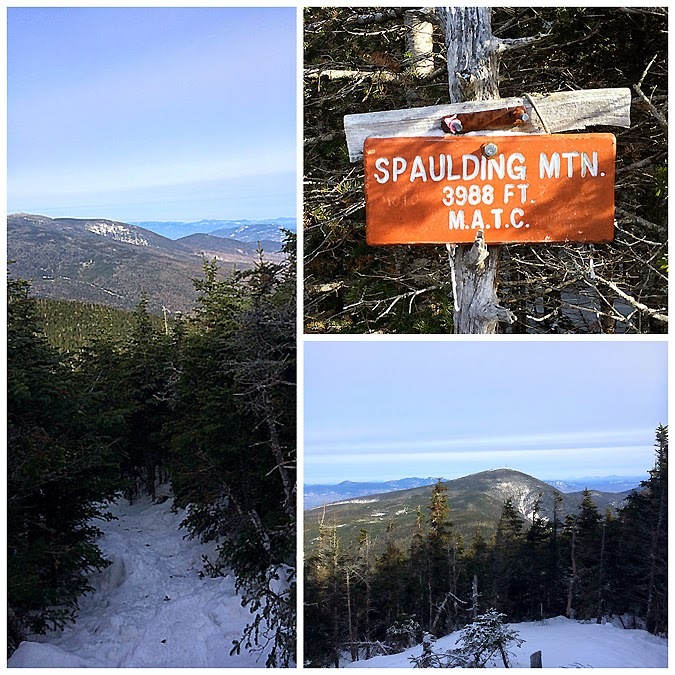 - A little over a month ago I was invited to head up to Maine by Pam and Matt to break in the new year hiking Maine's four thousand foot peaks in the Stratton region. 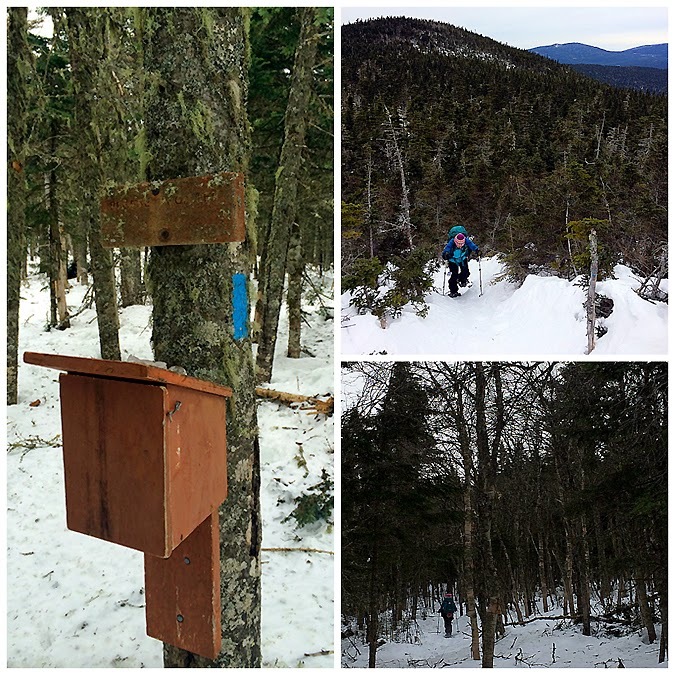 The last time I had hiked in the area was well over twenty years ago with my parents and brother in Rangeley on a wet and muddy summer weekend. - Also joining in on the hike were Tim, Mike, and Whitney. Between all of us there was a lot of time logged on the trails over the years. Both Whitney and Mike have been known to go for long walks, A.T. for Whitney and PCT for Mike! 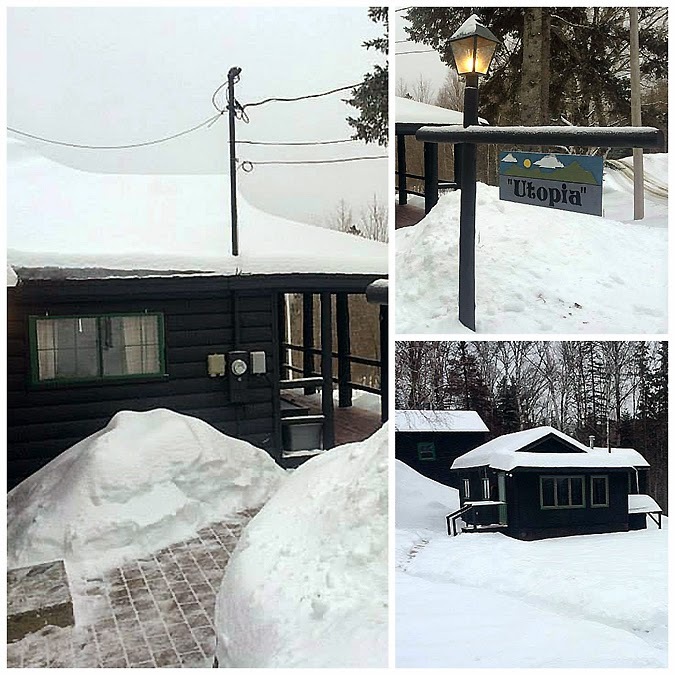 - We stayed at a real cozy cabin in Eustis, Maine, about ten miles north of Sugarloaf Mountain ski area and about thirty miles south of the Canadian border. 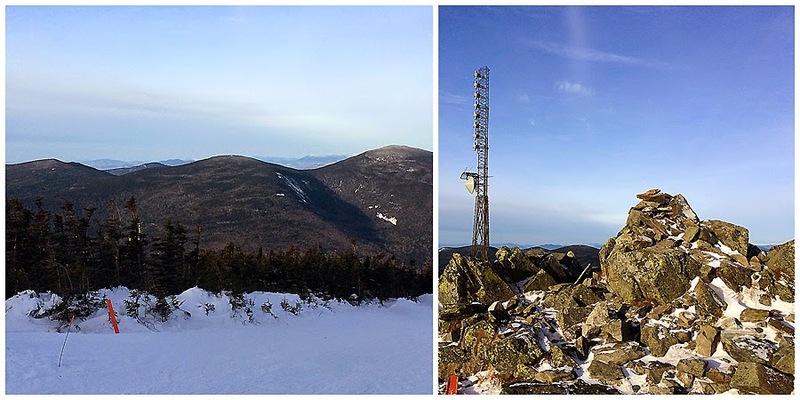 I have seen some pretty big ski areas but Sugarloaf is by far the most impressive I've seen in New England. 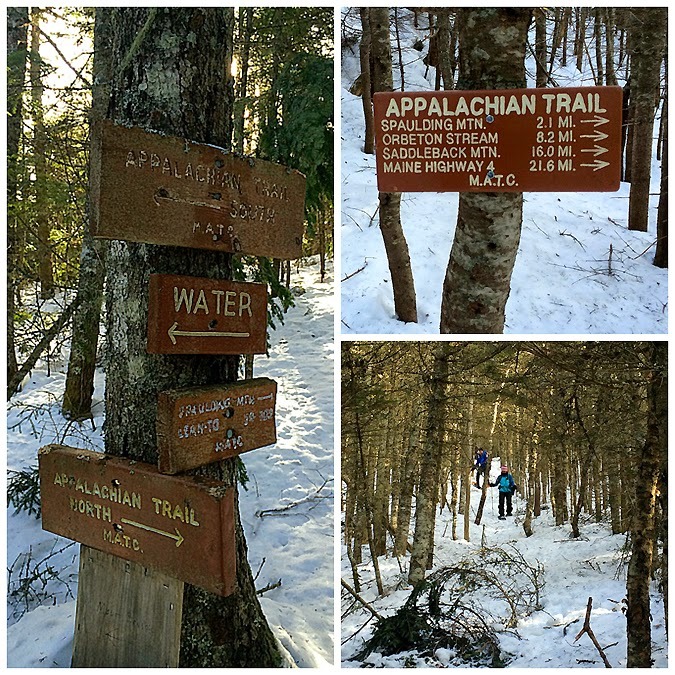 - Our goal for Friday was to hike South and North Crocker via the Appalachian Trail and then bushwhack over to Mount Redington. 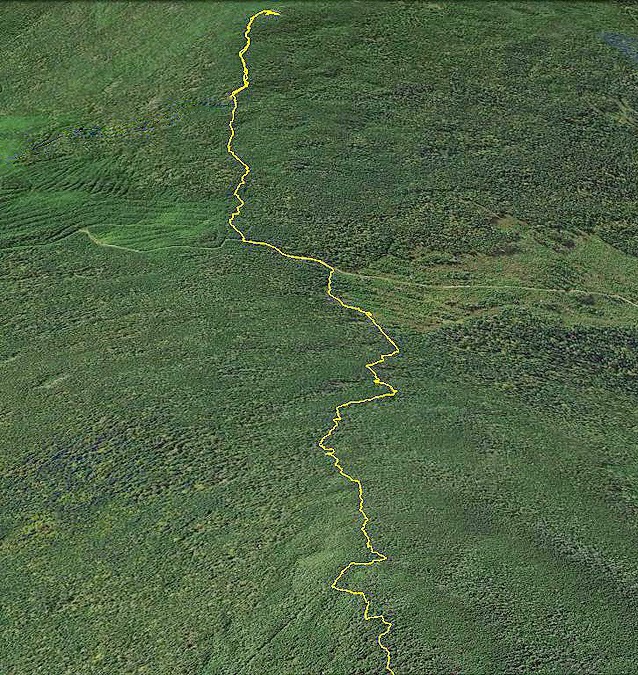 The Appalachian Trail can be accessed in the Caribou Valley off Caribou Valley Road (CVR). 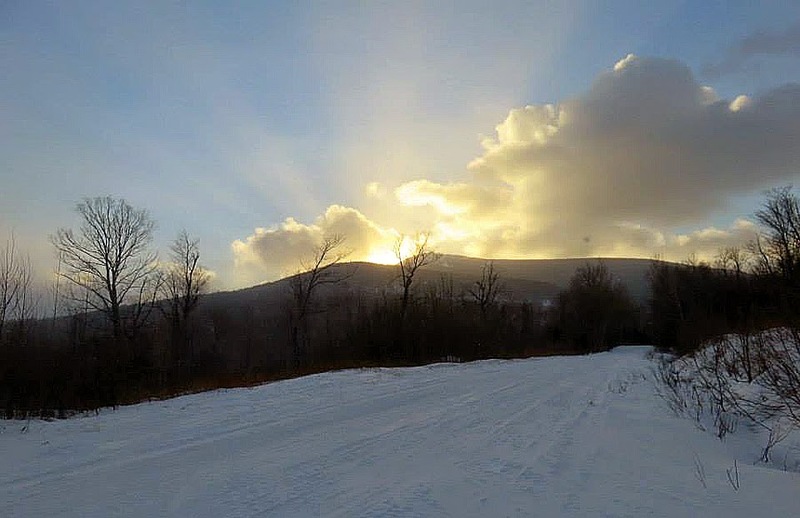 However, in the winter the road is closed so you can either park off of Route 27 and road walk over five miles, or you can cut half this mileage off by starting from the Sugarloaf golf course's pumping station located just below the eleventh tee. From the tee box we cut into the woods and started our bushwhack at a general southwest direction to intercept the CVR. The whack was more like a walk in the woods and with the solid snow pack it was a very easy trek to the CVR coming in just under a mile in length. - From here we walked the packed CVR to the junction of the A.T. We didn't see any other hikers but were passed by four snowmobilers who were ripping it up the road. Other than one section where we were in the wind the CVR was a nice walk with a good view of Sugarloaf Mountain just past the three mile marker. At mile 4.5 the A.T. crosses the road, it's not easily seen, although it does have flagging, the trail sign is located about fifty to one hundred feet from the road so it's not seen until you start hiking. 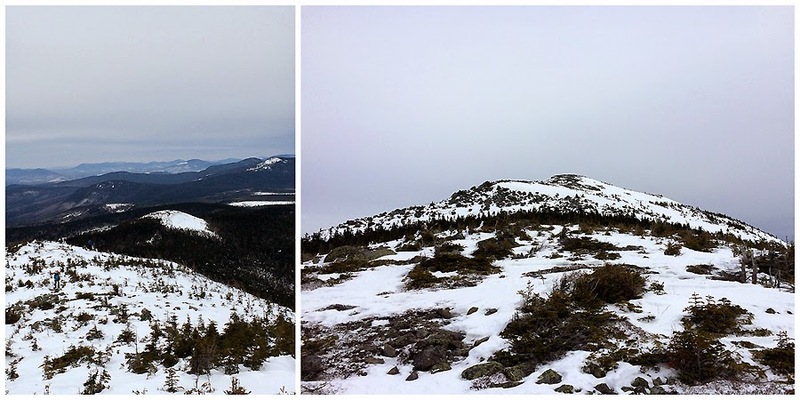 - It felt good to finally be hiking up to the first mountain of the day, South Crocker. 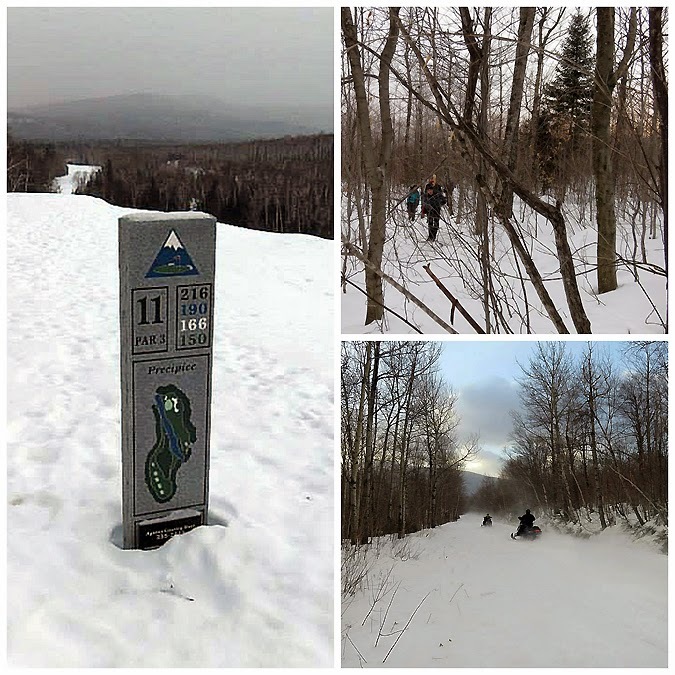 It's two miles from the CVR, the first mile has very easy to moderate grades and with the hard packed snow the footing was excellent. After a mile we reached the Crocker Cirque Campsite area where we took a break and changed from light traction to snowshoes for better traction and also raised up our televators for the upcoming steep section (televators are a heel lift that reduces fatigue while improving traction and grip). - From the campsite the trail is steep like the Mount Osceola Trail below East Peak. However, the steep part didn't last too long and this part of the trail had a few sweet views down into the cirque from a couple of exposed areas. The trail heads straight up one open area then skirts along the bottom of another one before heading back into the woods for good where the grades become moderate again to the wooded summit of South Crocker. 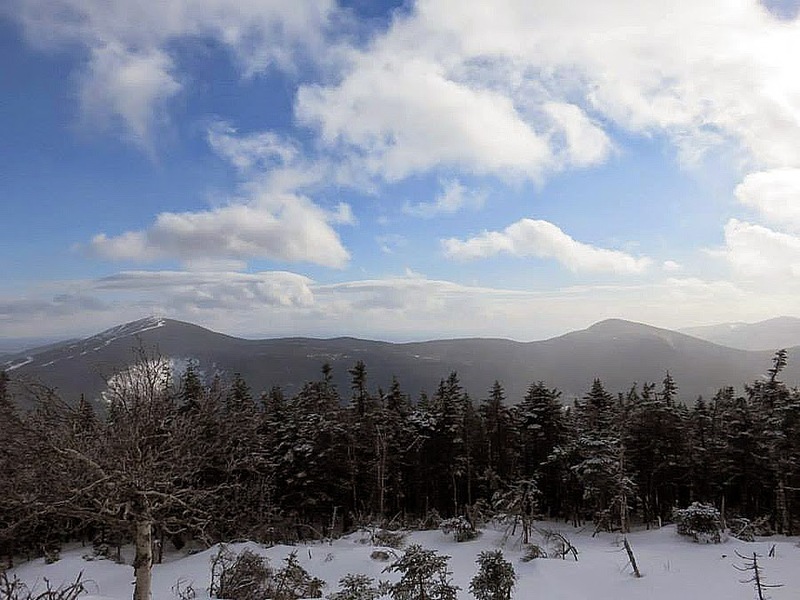 There is a pretty good outlook near the summit where you can see Sugarloaf, Spaulding, and Abraham to the east. - Before booking it down into the South / North Crocker Col we all took a few items from Pam's pack as she was not feeling as strong as she usually does as she is just getting over Montezuma Revenge and fellow hikers are always there to help one another out! - The hike down and up to North Crocker looked menacing but turned out to be a breeze, there were some decent views of Redington from the trail just below the summit of North Crocker. The summit has a downlook which had some nice views to the west into a wide open valley with a few tiny mountains. 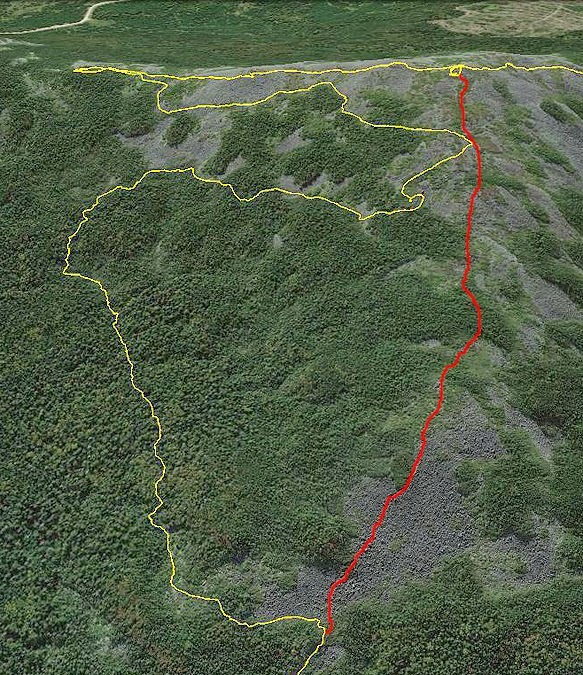 - Next we had to backtrack to South Crocker and then start our bushwhack which left from the South Crocker outlook. The bushwhack started out kind of thick but then opened up, there was flagging every so often that made the trek a little easier than I thought it would be. After heading down from South Crocker we hit the clear cut int he col and then started ascending and hit the CVR. We hooked onto the CVR for just a few minutes before ducking back into the woods where we hit a mixed bag of thick woods and semi open woods before hooking onto an ATV path that took us to the top. 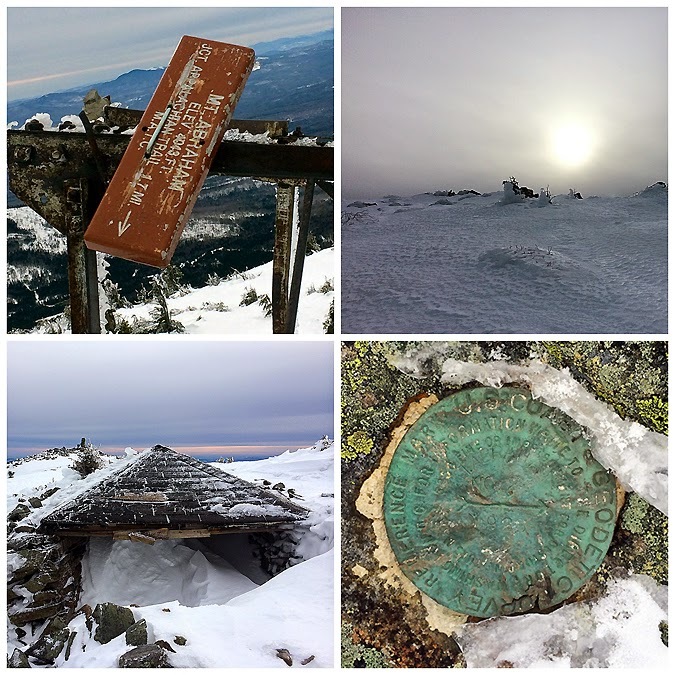 The summit of Redington has a pvc canister with an entry log, the summit used to have a tower so there is an open area with a decent view at one end. The wind was whipping on the summit and while my core temperature was fine, my fingers and toes started to lose their warmth even with the toe and hand warmers on. - After signing the note pad and taking pictures we headed down the well defined ATV trail back to the CVR. There were annoying blowdowns and leaners blocking the trail, especially towards the end making the CVR a welcome site to see. We had a long CVR walk back to the bushwhack and the eleventh tee but I didn't mind because I could now shut my hiking brain off and enjoy the easy stroll back to the Jeep. There are great views in spots along the CVR in the late afternoon and we were able to get back to the cars at dusk making for a prefect ending to an all day affair in the woods of Maine! The pictures for this hike are Whitney's as I accidentally deleted all my images from Friday's hike! Bushwhack up to Redington leaving the logging road from the col to the ATV path (up top). Whack down the ATV path from the summit back to logging road (CVR) bottom. 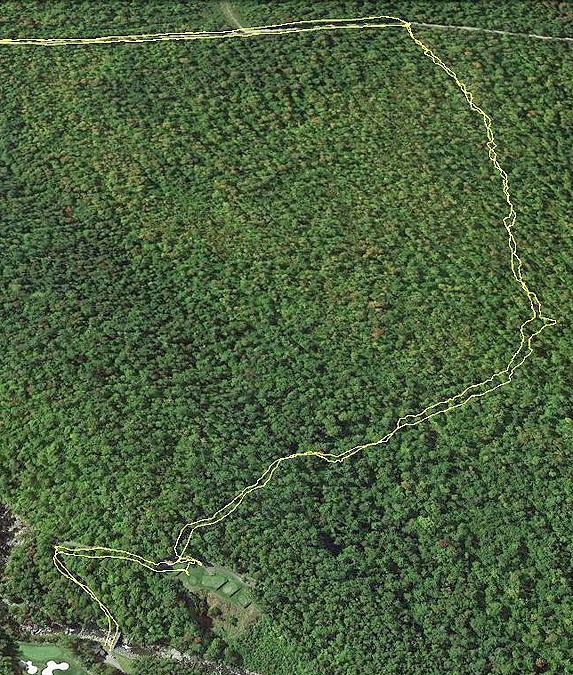 Red dots are where the bushwhack/ATV path hooks onto the road. Whack from Sugarloaf golf course, track starts at pumping station, heads over the small bridge, up a golf cart ramp to tee 11, then the track heads into the woods west to the CVR. - Saturday the temperatures dropped to zero making for a frigid hike were the name of the game was to keep moving fast enough to stay warm but not too fast to where we'd end up breaking a sweat. Pam and Mike decided that they were not going to join in and only hike Abraham meaning we could do a traverse over trails and avoid having to backtrack and whack down to the CVR from the A.T. / Abraham Side Trail junction. 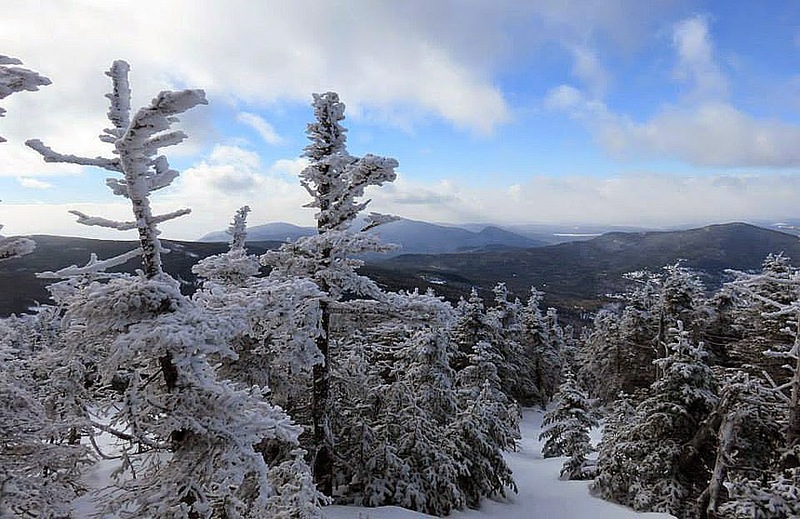 - In the winter you can buy a $10 uphill pass and hike the ski slopes to the summit of Sugarloaf. We got an early start and lucked out as by the time the mountain opened we were off open trails and on trails that were closed for the day making it an easy hike up to the summit. The peak of Sugarloaf has great views but it isn't really an attractive summit as there are towers and buildings around. We didn't stick around as there was a breeze that made for an extremely cold wind chill so we quickly hooked onto the Sugarloaf spur and headed back into the woods where we escaped the wind which would become non existent from here on out. - The hike over to Spaulding is about two miles and only becomes steep as you ascend to the western side of the summit cone. There were many blowdows along the way, which was the theme of the two days, there will be a lot of trail work to do come spring that's for sure! 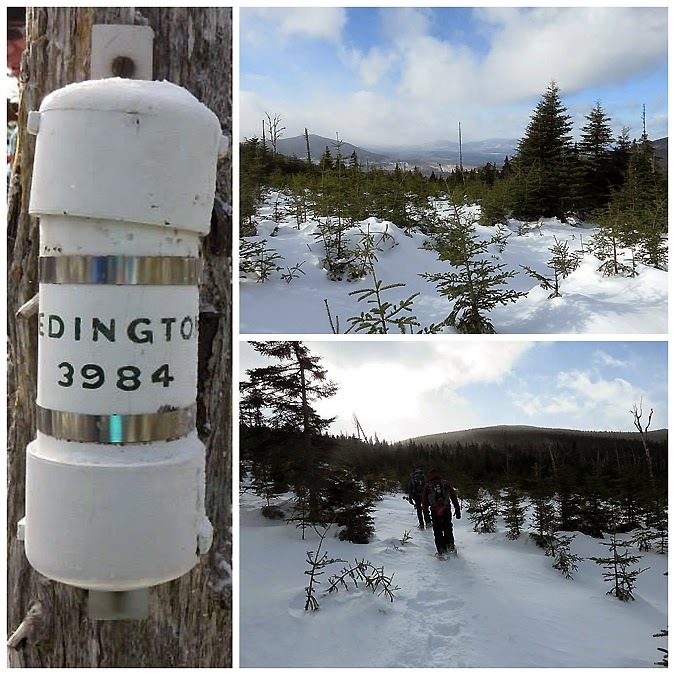 - The summit of Spaulding has a sign that reads 3988 but in reality it is 4010. 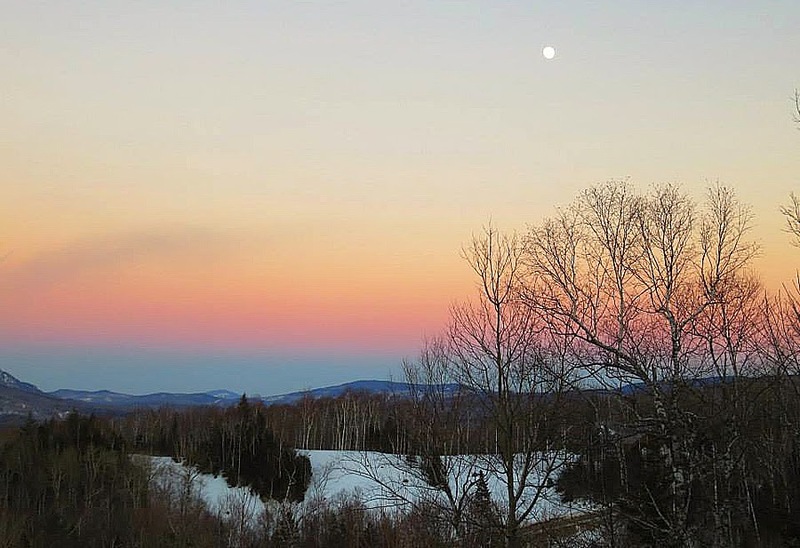 There is a great outlook to the north of Sugarloaf and the Bigalows that we enjoyed before heading south along the A.T. and over to the Abraham Side Trail. 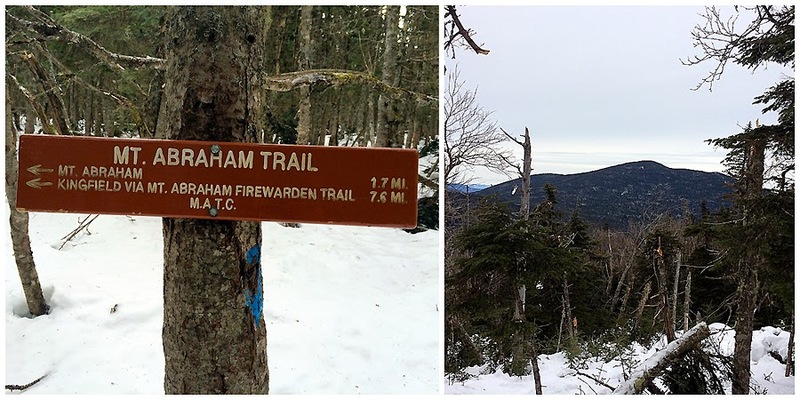 - The hike over to the Abraham Side Trail was more of the same, a few blowdowns, although not as many, some care required to stay on the trail, lots of hard packed snow, and no views. We made good time to the junction where we made our final uphill push of the day of 1.7 miles to the summit of Mount Abraham. - The final half mile hike to the summit of Abraham was my favorite part of the day. 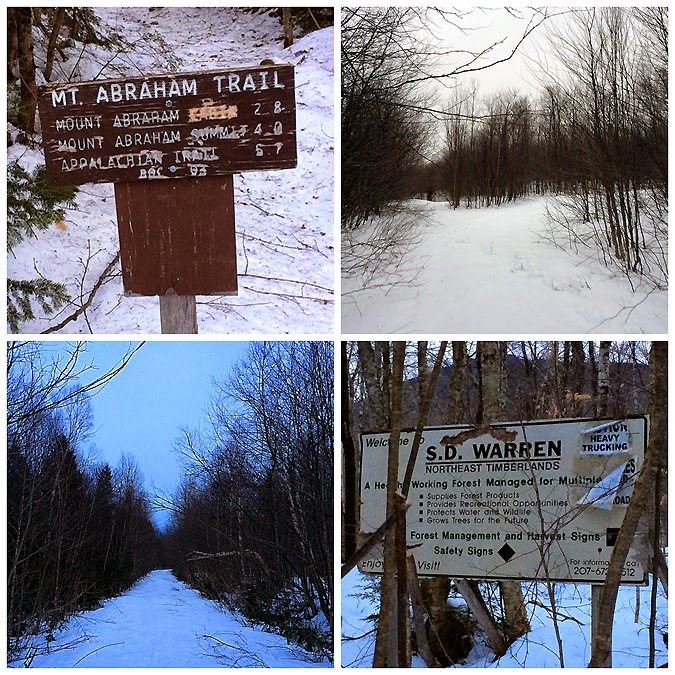 The Abraham Side Trail travels over an exposed ridge with great views of the top of the mountain. 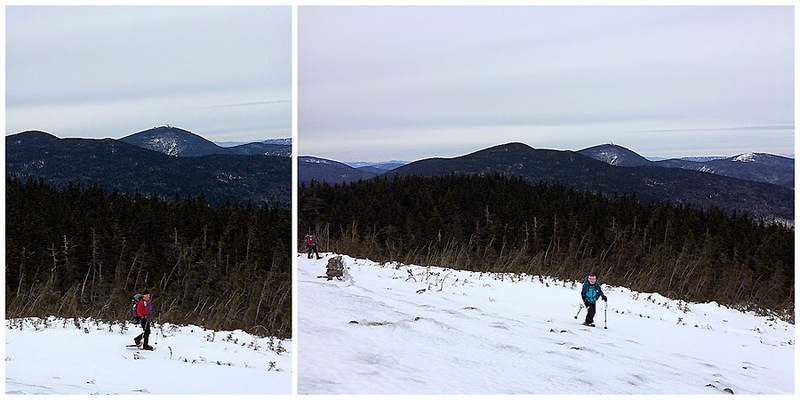 It reminded me of the Osgood Ridge from Osgood Junction to the summit of Mount Madison albiet on a much smaller scale. - We really lucked out on the weather, although it was extremely cold there was no wind so we could enjoy being above the trees. The summit had an old tiny tower that had been blown over, the roof to the tower had been moved and placed over a three sided shallow boulder shelter. 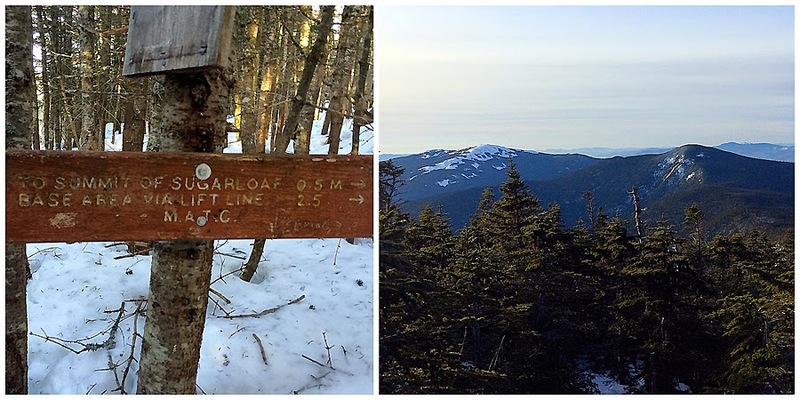 - From the summit we started to follow cairns to the east for a few tenths of a mile but realized they weren't for the Fire Wardens Trail but just a non official trail of cairns leading to a sub peak of Abraham. So we started to cut down and back west to intersect the Fire Wardens Trail which left the summit heading north. As we neared where we thought the trail would be I heard a voice yelling below us, it was Mike emerging from the scrub! He told us how he needed his crampons for a safe ascent and Pam didn't have hers so she turned back. None of us had our crampons, however, we had snowshoes with real aggressive crampons on them so the plan was to follow Mike back down in the scrub closest to the trail to avoid the steep stuff to a way-point he had stored in his GPS device where he had left his snowshoes. 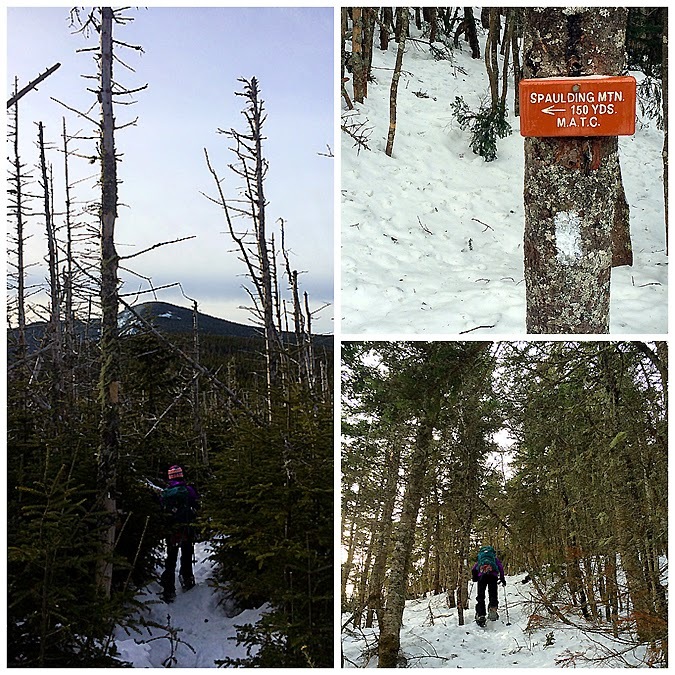 We made it back to the snowshoes but instead of hugging the scrub we ended up heading too far to the east before cutting back to the northwest through some pretty gnarly woods. Still, Mike's help back to the trail was definitely better than heading back down the Abraham Side Trail and whacking back to the CVR which is most likely what we would have done if we couldn't have found the trail. - The rest of the hike out was pretty uneventful, there was one last patch of blowdowns to navigate, a small logging road walk, and two iffy looking but solid water crossings to make a tenth of a mile from the cars. 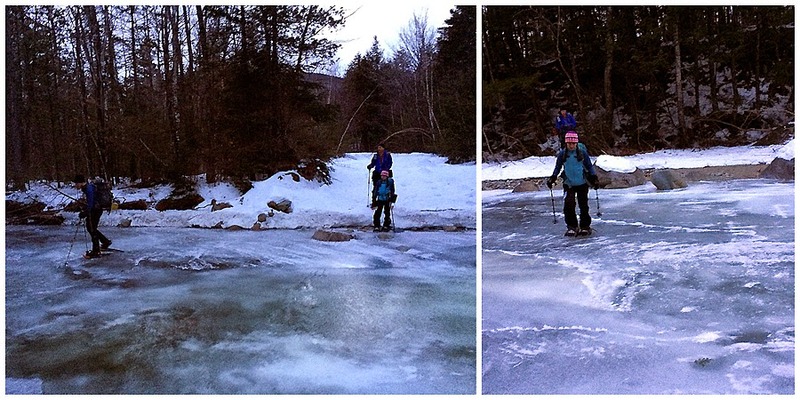 We made it back to the cars just as it got dark ending a cold but fun hike over some very lightly used winter trails! 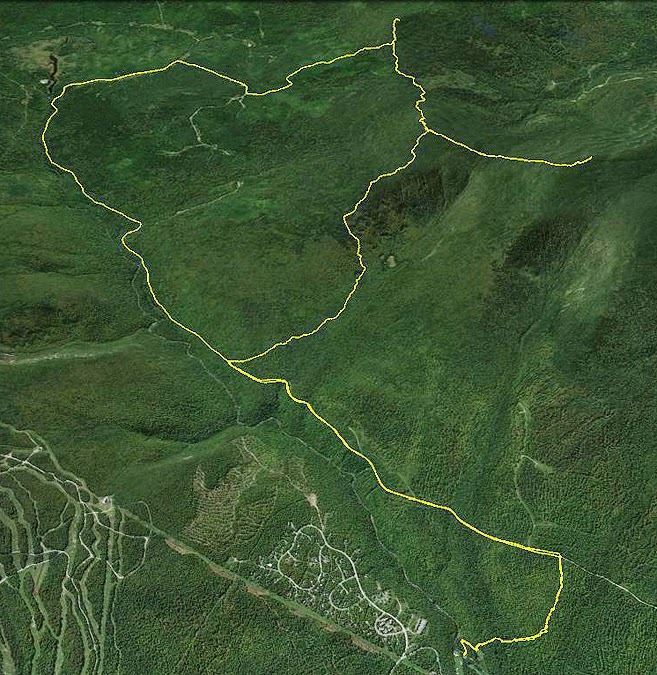 - Hiking these six peaks gets me closer to the North East 115, (the 115 highest peaks in the northeast). 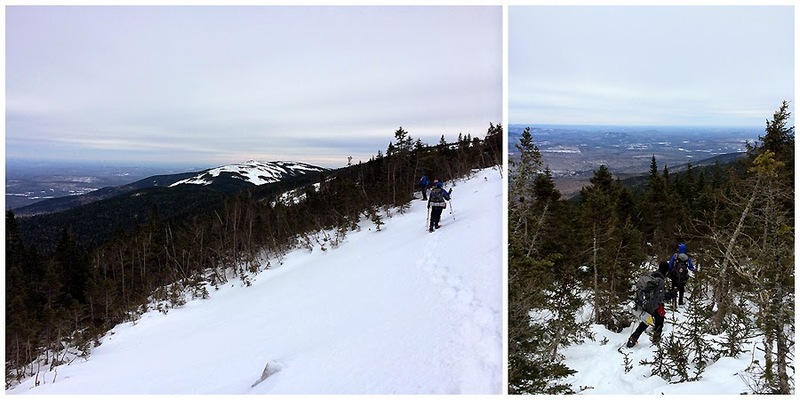 I now only have five left, four in Maine (Saddleback, Horn, West and Avery Peak in the Bigelows), and one left in the Catskills of New York (Slide). I'm in no rush but I think I will finally finish these off this summer. I have a few different lists I will work on, too. 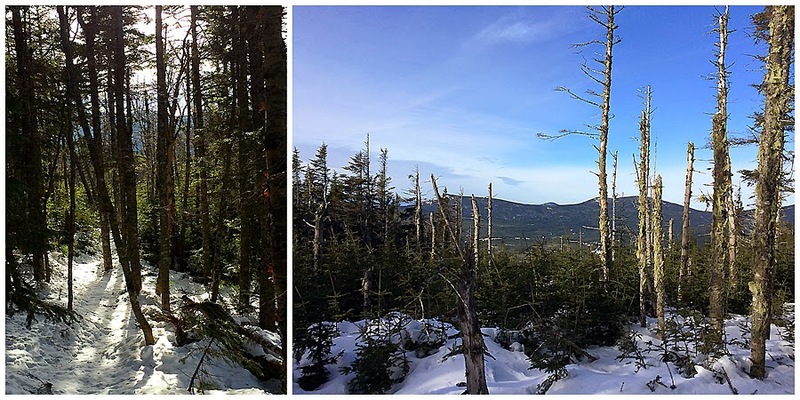 I'd like to hike more of the ADK's in the winter and explore more off trail there in the summer. Finally, I'm 70% done with the White Mountain Grid without ever trying! 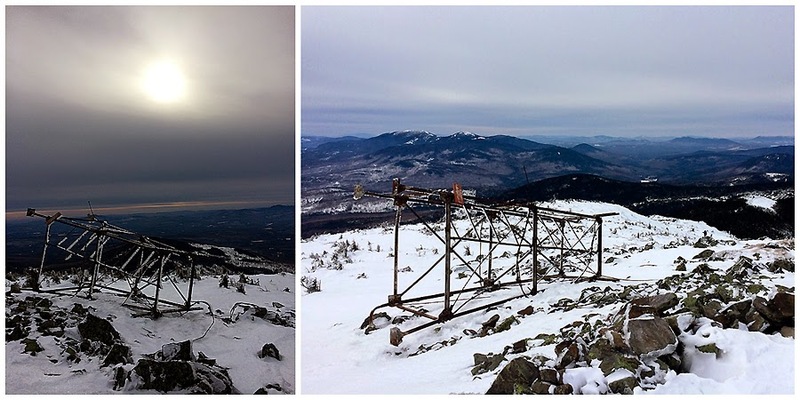 The Grid is hiking all the 48 - 4,000 footers of New Hampshire in every single month. (not in one year, over time). I already know how I'll finish it, it will be something crazy, which is the norm if you been following this blog! 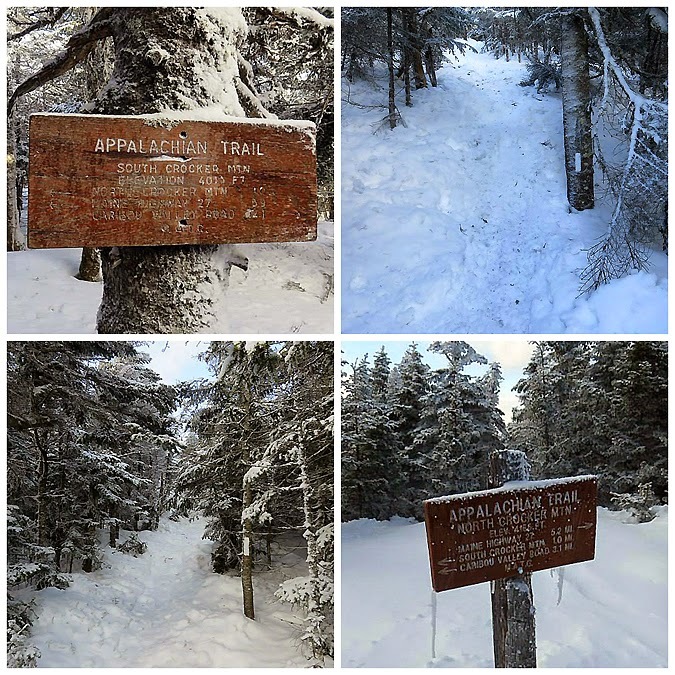 My goal is to finish in June of 2016 or June 2017, this gives me time to enjoy the remaining peaks by hiking trails, bushwhacks, slides, and trail runs to keep it interesting and fun while being able to head to the ADKS, Maine, and road trips as well! 2015 should be a blast! 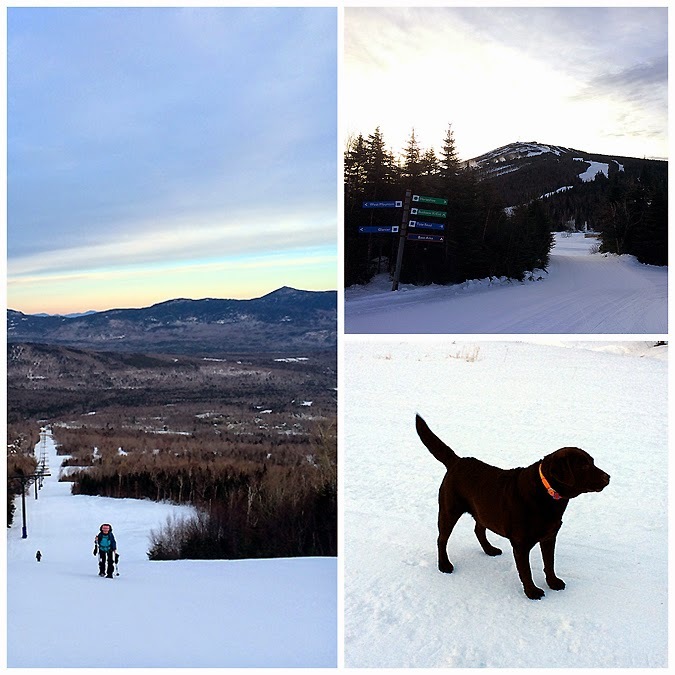 Heading up the ski trail during the frigid early morning hours. Looking down the ski trail below the chair lift with Bigelow's the Horn in the background. Crockers and Redington as seen from the top of the ski slope. Sugarloaf's rock pile summit. 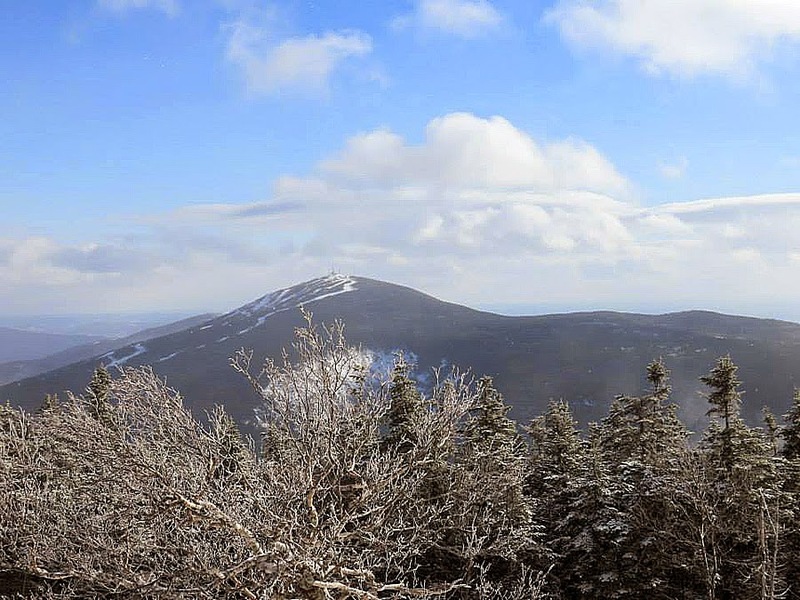 Mount Abraham's above timberline peak as seen from Sugarloaf. Heading down the Sugarloaf Spur there's a decent view of Spaulding and Abraham. Along the A.T. on the way to Spaulding Mountain. 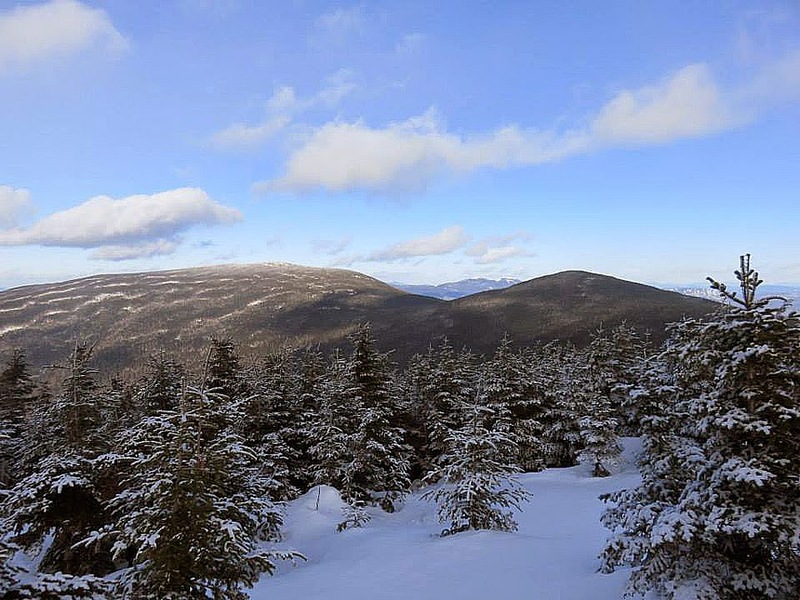 Sugarloaf Mountain from the Spaulding outlook. 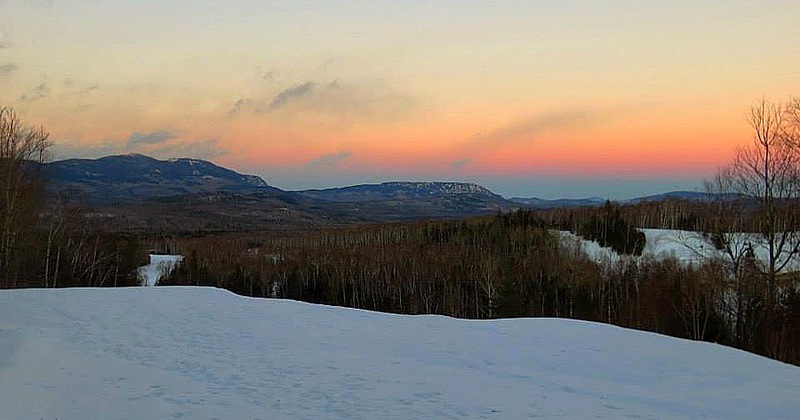 Looking towards Saddleback and the Horn. Appalachian Trail and a semi open view descending Spaulding Mountain. Abraham Side Trail with a view back to Spsulding Mountain. Summit tower has fallen down! Leaving the summit and following the wrong cairns, heading back and running into Mike, the bushwhack back to the trail which is in red! Excellent trip report and brought back a lot of memories from this summer! Nice to see what those areas look like with snow. The pictures of the bushwhacks are great. Lots of information here, thanks for posting for others to get an idea of the route and details! Thanks, Anonymous. Glad you can use this report for route finding and info!